When turning at an intersection, Washington law requires you to turn from the lane that is closest to the direction you want to go and turn into the lane closest to the one you came from. When making turns, go from one lane to the other as directly as possible without crossing lane lines or interfering with traffic. Once you have completed your turn, you can change to another lane if you need to. This applies to both left and right turns. When there is a center turn lane, be sure to use this lane for turning only. These lanes are not for passing; and traveling more than 300 feet in one of these lanes without turning can result in a ticket. Here are the Washington Rules of the Road for turning at an intersection. RCW 41.16.290: Required position and method of turning at intersections. Right turns. Both the approach for a right turn and a right turn shall be made as close as practicable to the right-hand curb or edge of the roadway. Left turns. The driver of a vehicle intending to turn left shall approach the turn in the extreme left-hand lane lawfully available to traffic moving in the direction of travel of the vehicle. Whenever practicable the left turn shall be made to the left of the center of the intersection and so as to leave the intersection or other location in the extreme left-hand lane lawfully available to traffic moving in the same direction as the vehicle on the roadway being entered. The department of transportation and local authorities in their respective jurisdictions may designate a two-way left turn lane on a roadway. A two-way left turn lane is near the center of the roadway set aside for use by vehicles making left turns in either direction from or into the roadway. Two-way left turn lanes shall be designated by distinctive uniform roadway markings. The department of transportation shall determine and prescribe standards and specifications governing type, length, width, and positioning of the distinctive permanent markings. The standards and specifications developed shall be filed with the code reviser in accordance with the procedures set forth in the administrative procedure act, chapter 34.05 RCW. On and after July 1, 1971, permanent markings designating a two-way left turn lane shall conform to such standards and specifications. Upon a roadway where a center lane has been provided by distinctive pavement markings for the use of vehicles turning left from either direction, no vehicles may turn left from any other lane. A vehicle shall not be driven in this center lane for the purpose of overtaking or passing another vehicle proceeding in the same direction. No vehicle may travel further than three hundred feet within the lane. 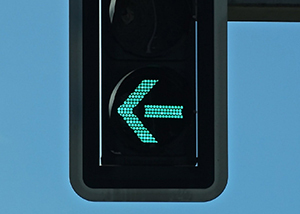 A signal, either electric or manual, for indicating a left turn movement, shall be made at least one hundred feet before the actual left turn movement is made. The department of transportation and local authorities in their respective jurisdictions may cause official traffic-control devices to be placed and thereby require and direct that a different course from that specified in this section be traveled by turning vehicles, and when the devices are so placed no driver of a vehicle may turn a vehicle other than as directed and required by the devices. Failures to make a proper turn can quickly result in a car accident or even wrongful death. If you are injured in an accident you need an experienced and knowledgeable personal injury lawyer in Spokane on your side. The attorneys at Parke Gordon Law Firm will work hard to get you the compensation you deserve. Contact the law office of personal injury attorney Mat Parke today for a free consultation. This is your opportunity to speak with an experienced personal injury attorney about your case for free. Call (509) 482-7274 to get started on receiving a fair settlement from your personal injury case.